Halloween 2008 updating coming don’t go anywhere. MY DOG RAN AWAY LAST NIGHT THE 27TH SHE IS A YORKIE. HER NAME IS DAPHNE. PLEASE IF YOU FIND HER CAN YOU EMAIL info@gerritsenbeach.net . SHE WEIGHS ABOUT 7 POUNDS AND SHE IS TAN AND GRAY. I know this site is geared more towards Gerritsen Beach but I figured a lot of people in other areas still read this site. IDT Energy Scammers in Gerritsen Beach! If you were planning on attending the Senator Golden Town Hall tomorrow, it just got canceled. Some pesky law got in the way. ASYLUM Point of No Return. Champion Fitness is now at least three store fronts long. Good for them. If you missed it, you missed a great event for the kids. What a better way to spend your Saturday afternoon as a family then by scaring them to tears. Police Officers, CERT Members, and Volunteers were on hand escorting the crowds into the walk. Which had a variety of spooky scenes and scary ghosts jumping out at you. 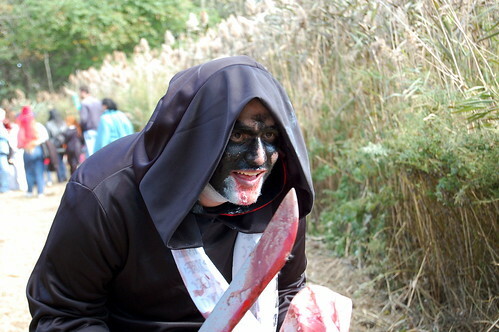 If you have never checked out a photo gallery before please, check out Marine Park Halloween Walk. and if you even more brave, click more or look below and see some of the pictures. One year since Hibernians lot was sold. The walls are now up. Two years since Leons closed. Two years since Msgr Fahy died.